Eastman Kodak Co. 1957 Ad. This color July 23, 1957 ad states From Kodak. A Precision Built Brownie Movie Camera for only 29 dollars and 95 cents. Now you can take color movies at snapshot cost and with snapshot ease. Picture shows man with Brownie Movie Camera by lake taking movies. Two women in sailboat are waving. Magazine tear sheet picture is taken through plastic and may show wrinkles or crookedness that is not in the ad. This Original magazine tear sheet measures 10 1/4 inches wide by 13 1/4 inches tall. 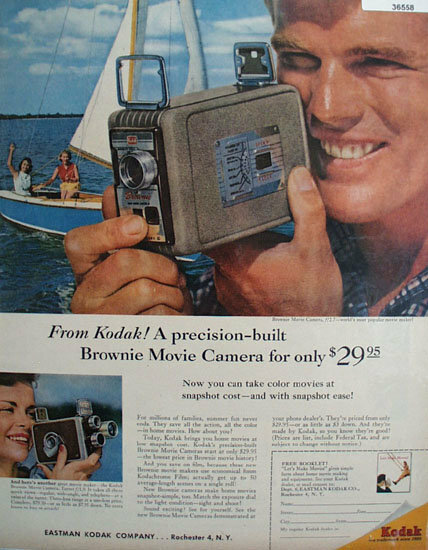 Items Similar To "Eastman Kodak Co. 1957 Ad"